It was the early 2000s in St. Louis when BraveSirRobbin, Dickie, Dudsmack, and Lodsiek looked to take their private LAN parties public. Although there were a few small experiments before it Laclede’s LAN had its first official event in 2004. Between 2004 and 2008 there would be 12 more events “prime” events with the largest drawing 248 pc gamers from as Western Canada. 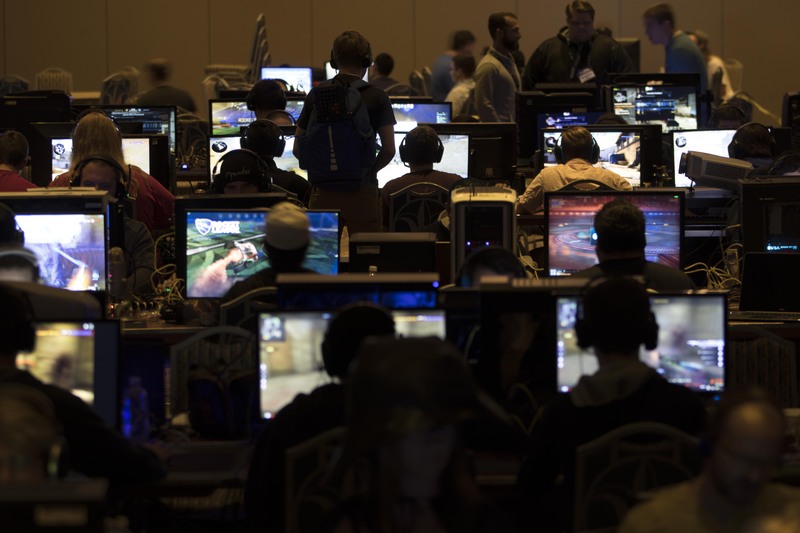 In addition to a few smaller “LL Lite” events for our most loyal fans there was one event that provided a whiff of the future to come: The Hurricane Katrina Relief LAN, our first charity LAN. We learned many things over the years, and made long-lasting connections and friendships with the community. When we first started LL, we couldn’t have known what it would grow into – but it had become a huge part of our lives, and it was with some disappointment that we decided to take a break after our thirteenth event, “LL13”. Staff members and volunteers have come and gone over the years, and without some of them Laclede’s LAN would never have grown to become what it is. Their hard work is still influencing LL today, and is a big part of why our community is so important to us. It started with allhawkeye’s idea for an anniversary LAN in 2014 to commemorate the first LL event in 2004. After talking it over with the staff, we quickly came to the conclusion that we were ready to reboot LL completely, and bring back our regular events. However, it seemed clear that LL should provide a greater benefit than it had before to be worth the time and effort, and so the idea of making LL a charity/non-profit organization was proposed. It was decided fairly early on in the process that we wanted to target the future of Saint Louis as a technological oasis, so we focused on ways to connect the enthusiasm of our community for technology with the need for young tech-savvy professionals in Saint Louis. As part of the push, the LL staff started by teaching a one-day class on computers to middle school kids at Saint Louis University. Excited about our newfound purpose, we began to plan Laclede’s LAN 14. Saint Louis University was gracious enough to provide our location - but now we dealt with the reality of servers, network, and electricity. We decided to present our idea to the community via a Kickstarter campaign in July 2014. Our campaign received a lot of attention but despite raising almost $7,000 we didn’t reach our goal in time. Fortunately, somewhere in our page full of videos and prose dedicated to our love of LANs, we caught the attention of LANFest. LANFest is a national, non-profit organization dedicated to supporting charities, providing great exposure for their sponsors, and (perhaps most importantly) having fun. After meeting the LANFest team we were excited to become their Saint Louis chapter. By working with LANFest we were able to borrow the needed networking gear and connect with all the sponsors needed to make LL14 achievable. Laclede’s LAN 14 has come and gone, and after knocking the rust off, we’re still iterating, improving, and looking for more ways to throw the best LAN parties around. Over the years, we’ve had help from countless community members and friends who love what we do and what we represent. We encourage everyone to get involved! Laclede’s LAN is a community – it always has been – and we rely on YOU to flourish!